Pioneers in the industry, we offer meditation chair and meditation seats from India. 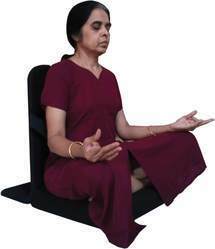 MEDITATION CHAIR You have sat under open sky near seasore or near river or in meditation hall or in forest & want to do meditation but due to limitation of your back bone you can not do meditation for long time but if you have meditation chair than you can enjoy. -	Comfort support of 24” height to back. -	Enough sitting space 18” x 18”. -	Secure pocket to keep your own items. -	Light in weight. - Easy to fold & Easy to walkwith. Feature of Meditation Chair -	Cushion for sitting is made out of 40 density PU in size of 18” x18” x 3” thickness. -	Made out of Powder coating CR pipe of 10 mm dia thickness of 1.6 mm -	Easy to carry size after fold is 24” x 18” x 15” -	Weight of Meditation chair is 2.150 Kg only. -	Available in Black foam laminated upholstery for more comfortabity. - Better quality elastic to hold cushion after folding. You have sat under open sky near seasore or river or in meditation hall or in forest & want to do meditation but due to limitation of your back bone you can not do meditation for long time but if you have meditation chair than you can enjoy. - Comfort support of 24” height to back. - Enough sitting space 18” x 18”. - Secure pocket to keep your own items. - Easy to fold & Easy to walkwith. 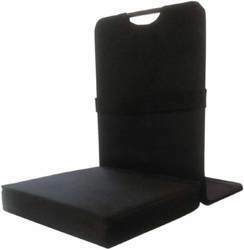 - Cushion for sitting is made out of 40 density PU in size of 18” x18” x 3” thickness. - Weight of Meditation chair is 2.150 Kg only. - Available in Black foam laminated upholstery for more comfortabity. - Better quality elastic to hold cushion after folding.